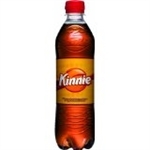 Kinnie is a unique tasting, alcohol-free, natural, refreshing beverage. Its golden amber colour, and the fact that it is made from bitter oranges and a variety of aromatic herbs, lend this beverage a bitter taste which is an excellent thirst quencher. Undiluted Almond Squash. One of Malta's Favorite Drinks. Kinnie 12 Pack 50cl Kinnie is a unique tasting, alcohol-free, natural, refreshing beverage. Its golden amber colour, and the fact that it is made from bitter oranges and a variety of aromatic herbs, lend this beverage a bitter taste which is an excellent thirst quencher.